The Reverend Okuno Masatsuna and his wife, n.d. From "Japan Evangelist," Jan. 1894. [Tokyo] Sept. 16 : At dinner a talk with Mr. Carrothers on the subject of the Union church Mr. Thompson is about to organize. Somewhat stirred up at his statements though not unduly, I am sure. Mr. Thompson came over at 8 o’clock. The whole evening spent in talking of this matter till too late even. O how I hope and trust and pray that he will be guided of God in every particular. I know he loves Zion and her peace, would that all loved her as well, but the wise all wise Father guide him in this that no unnecessary trouble, and no harm may come of it. Sept 23: An interval full of interesting events has passed….The native church was organized Sat 20th but not by Mr. Thompson—by the native elders themselves. They chose Mr. Thompson for their pastor, and he accepted the place. All our missionaries were present. Mrs. Pruyn and Miss Guthrie came also. A most interesting and affecting time. The elder Okuno [Masatsuna] much overcome. Miss Y[oungman] returned yesterday. Her agitation of various questions has occasioned me much concern. I want to do what is my duty to her, to the woman’s Board, and to my dear friend whom God has given me, and who makes my life so complete. I ask guidance continually. Once more spent a happy evening with Mr. Thompson—and our work of making a Japanese Grammar goes on slowly.—We had school in his rooms, as the church is being lacquered. This is the first time I have ever been in his house.—The rains and violent winds have continued all day…. My teacher did not come this morning, of course, nor did I go over to teach this afternoon. Japan appears in one of her less pleasant phases today. The Japanese, however, have not the difficulty in going abroad that we would experience. They tuck up their garments above their knees or higher, raise their umbrellas, and trudge along. Sept 29: Even. A gloomy rainy day. Sat by the fire and studied or wrote or read all day. A very pleasant time with my teacher. We talked of the power of the Holy Spirit and of the joy that shall fill earth and heaven when Japan turns to God. Mr. Carrothers and Mr. Thompson came back from Yokohama after six o’clock. Their missionary meeting passed pleasantly, and I am very glad. Seventy-five dollars were assigned for Miss Youngman’s teacher and the same for mine. Mr. Thompson brought my quarter’s salary and also a letter from Miss Youngman in reply to the one I sent her this morning. She seems very fully to approve of my proposed change of life [Mary’s forthcoming marriage to David Thompson], and I am very glad that the making the revelation is over with. Appropriations were also made at the meeting for a lot and building a house for Mr. Thompson. The next thing in order, I suppose is to write a letter of confession to Mrs. Graham, and also similar letters home. I have this evening payed [sic] Mr. Carrothers ninety-eight dollars for four months boarding, one month of which I owed and three in advance, counting from Sept 25th, 1873. Mr. Thompson came back with a severe head-ache, and so stayed with me but a little while tonight, but he is happy and so am I.
Oct 5: Mr. Thompson preached again today, and it was also communion Sab. A full house and a most pleasant service. The sermon was a contrast between Paul’s entry into Jerusalem and the entry of Jesus Christ. Many thoughts were presented to me new and striking. Every day I am made gladder and more confident in my dear love’s earnestness and ability. These Sabbaths are sweet. Sweeter than ever in my own Christian land, I believe. I hope the Japanese who stayed for Communion were impressed with the simple, solemn service. I hope the Holy Spirit whispered to them that which they will not and cannot forget. Oct 7: Ogawa took my letters to Yokohama today. Wrote to Father, Rebecca, Sarah and Kate, Mrs. Graham, and Mrs. Wallace. Mr. Thompson also wrote a letter of confession to Father which I inclosed [sic] in mine. Oct 8: Dr. [Charles Wesley] Vrooman, a [Presbyterian] missionary from Siam, came here to board for a few weeks today. I hope we will find pleasure and profit in his company. Oct. 9: Ogawa and Okuno set out on their preaching tour this morning. The account of their departure impressed me deeply. The more I think of it the more it looms up in simple, holy dignity and importance. They rose early and girt themselves for their journey. Then together they knelt down and in a short and simple prayer fervently asked God’s presence with them and blessing upon them….Two such honest and earnest men with the light of heaven in their souls and shining through into their faces God will surely bless and incline the people to hear. This Union church was not connected to a presbytery--an “independent position” that was frowned upon by the PCUSA Board of Foreign Missions. 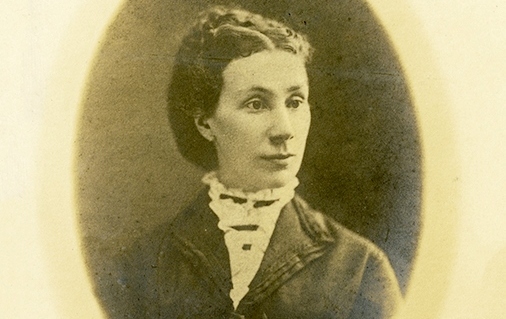 Mary Putnam Pruyn arrived in Japan in 1871 under the auspices of the Woman’s Union Missionary Society of New York City. She founded a girl’s school in Yokohama.